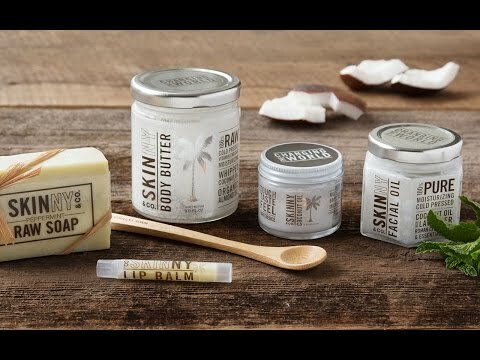 Treat your body to raw coconut oil body products that will moisturize and nourish from head to toe—and inside and out, too. The Premium Beauty Box was created to enhance your beauty the natural way. 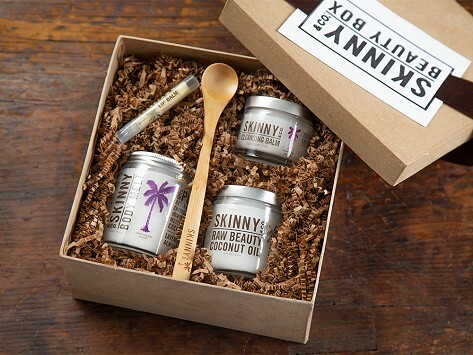 The handcrafted gift box holds all of the well-loved products and is a perfect gift for someone new to coconut oil. Skinny & Co.’s coconuts are hand-harvested in Vietnam. The oil is cold pressed, which keeps it in its purest, most nutrient-rich form. Other natural ingredients like essential oils and shea butter compliment the coconut oil as it moisturizes your hair, skin, and lips. Please note: This product contains tree nut oil and sweet basil. Allergen information: This product contains tree nut oil and sweet basil. Body melts will melt when warm, but that will not affect the quality or consistency of the product. Instructions: Apply to clean, towel-dried skin whenever skin needs a boost of moisture. Body melts can be used as after-sun skin care, as a healing shaving cream, and as effective bug and insect repellent.